Hello again! My next step in building up the troop base for the 215th was to get a company command squad and some veteran squads assembled. I knew that I wanted to get lots of plasma in the CCS, and at least one plasma-vet and one melta-vet squad sorted out. 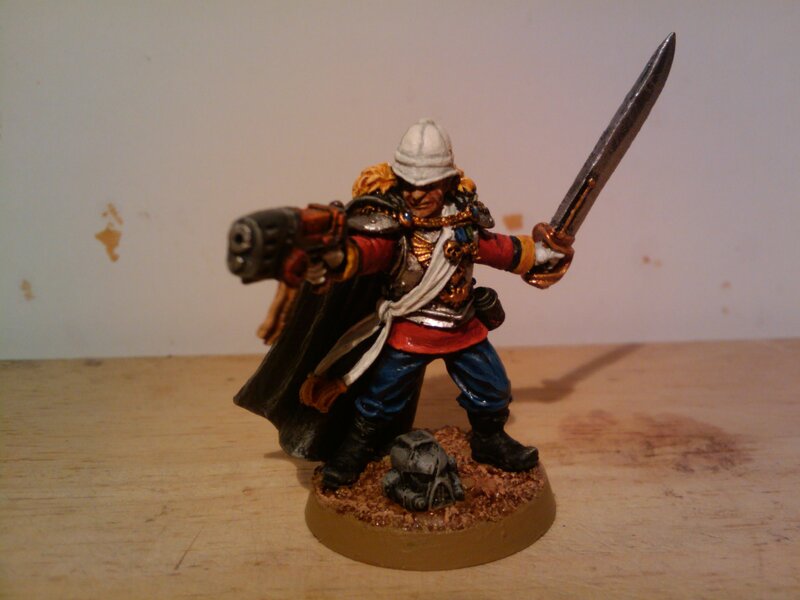 For the company commander, I went with the GW Lord Commissar model with a simple head swap and plasma pistol. The CCS is a combination of Curious Constructs Life Guard bodies, with Victoria Miniatures for the rest, (apart from the plasma guns which are from Forge World). The same approach was taken with the Grenadier plasma-vets, with the addition of a las-cannon on a CC gun carriage. There are a few other bits and bobs in there, like the banner and bionic arm (rogue trader era parts). The models worked out really well, with the Curious Construct/Vic Mini parts fitting together nicely with a bit of minor work with a file. I’m not so happy with the plasma guns to be honest, no real options for the left hand, hence all the pointing! But, they do the job, and these have become my go-to units. 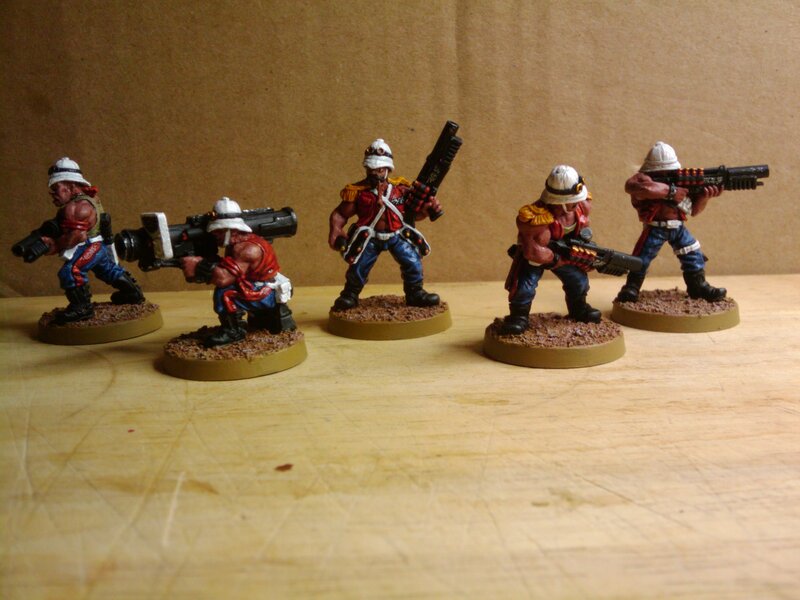 I went a little off piste for my melta-vets… I mentioned that I had some old metal Catachans? 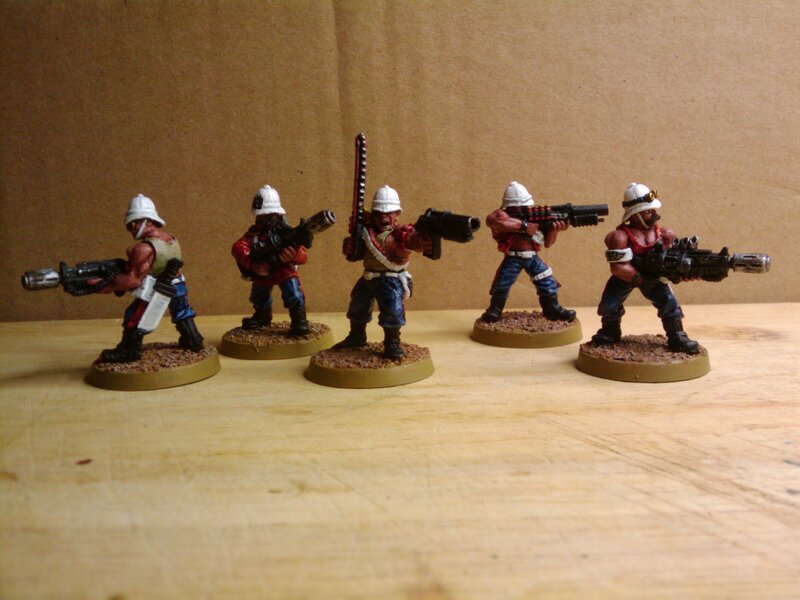 Well, I had enough models to make a fully packed melta squad (if I chucked in a spare Cadian) and I wanted them included for nostalgic reasons (my first ever guard squad), but I didn’t want to have a random squad of jungle fighters in the ranks. 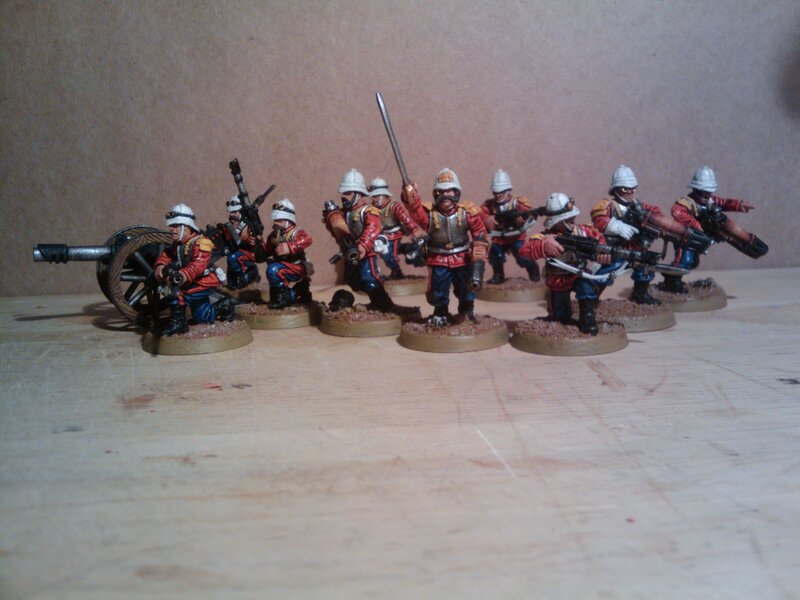 I had the idea of giving them pith helmets, dress trousers and painting them as Praetorians, and came up with some background fluff to explain the state of their uniforms. The idea is that this is what is left of a regiment that were posted to a protracted and vicious campaign on a high gravity jungle world. Their Praetorian uniforms and equipment was hopelessly impractical for jungle fighting, so they had to adapt their kit to the conditions (cut sleeves off jackets, or ditched them altogether). These are the survivors of that campaign, posted with the 215th but bringing their maverick jungle style with them. 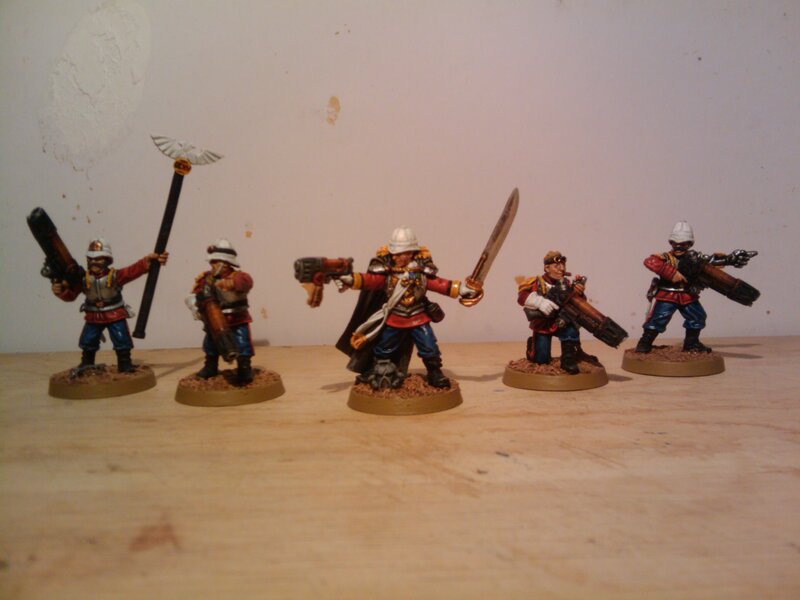 Paint-wise, they will follow the standard colour scheme, reflecting their origins as regular Praetorians who modified their dress uniforms in the field. Being a bunch of muscle-bound nutters packing shotguns, HQ pretty much leaves them to get on with it! Brilliant but what does CCS mean? I’ve always liked the Praetorians but these days they are so bleedin expensive! One day I’ll build a small army but probably be a 24th foot ode kind of army hehe. Maybe a diorama and instead of Zulus I’ll have a whole bunch of Tyranids swarming over the meale bags haha.